From 01 January 1850 through to 1920, the City of Dublin Steam Packet Company operated a maritime mail and passenger service between Carlisle pier in Dún Laoghaire (then Kingstown) and the Admiralty pier in Holyhead, Wales. Having the Royal Mail contract to carry mail across the Irish Sea, the four ships covering the route carried the prefix RMS, for Royal Mail Steamer. Each ship has a mail sorting room, staffed by the Dublin Post Office. The four ships were called after the Irish Provinces, namely RMS Ulster, RMS Munster, RMS Leinster, and RMS Connaught. The Leinster was a 3,069-ton packet steamship with a service speed of 23 knots (43 km/h). The vessel, which was built at Laird’s in Birkenhead, England, was driven by two independent four-cylinder triple-expansion steam engines.During the First World War, the twin-propellered ship was armed with one 12 pounder and two signal guns. Build by Cammell Laird of Birkenhead in 1897, RMS Leinster was a 3,069 ton packet steamship with a service speed of 23 knots, driven by two independent four cylinder triple expansion steam engines. In order to prevent war materials and food reaching Germany, at the outbreak of World War I, the Royal Navy blockaded the English Channel and the North Sea between Scotland and Norway. Nevertheless, German submarines availed of limited freedom of movement. Camouflaged and with a Royal Naval gun crews, the ships continued in service during the First World War. RMS Leinster was armed with one 12pdr and two signal guns. On 03 March, 1917, RMS Connaught was torpedoed and sunk in the English Channel with the loss of three crewmen – having been commandeered by the War Office as a troop carrier. Four weeks before Armistice Day, shortly after departing Kingston, on Thursday, 10 October 1918, under the command of Captain William Birch, RMS Leinster, in the vicinity of the Kish Light, was struck by two torpedoes fired by the German submarine UB-123 and subsequently sunk. Commanded by Oberleutnant Robert Ramm, apparently, UB-123 was lost in a minefield, while attempting to return to Germany. On 18 October 1918, during its return to Germany, UB-123, after contacted a mine in the North Sea, sank with the loss of the entire crew of 2 officers and 33 men. Their bodies were never recovered. The sinking of RMS Leinster provoked widespread outrage throughout Allied nations. Germany responded on 20 October, agreeing to cease hostilities against merchant ships. The attacks stopped on 21 October, 2018 and, following an Armistice, World War 1 ended on 11 November 1918. When RMS Leinster sunk on 10 October, 1918, there were 771 individuals on board, including a crew of 77, all of whom were lost. Over 560 people were lost in the sinking, the highest ever death toll on an Irish owned ship. A large proportion of the lives that were lost were Irish, and probably far greater in number than the Irish who died on the Titanic in 1912 (78), or the Lusitania in 1915 (140). Those who died included the first Women’s Royal Naval Service to be killed on active service: Johephine Carr from County Cork. The ship’s crew was drawn from Kingstown and Holyhead. Civilian passengers came from many parts of Ireland and Britain. The majority of passengers that day were, however, military (and naval) personnel. They came from Ireland, Britain, the United States, Canada, France, Australia and New Zealand. 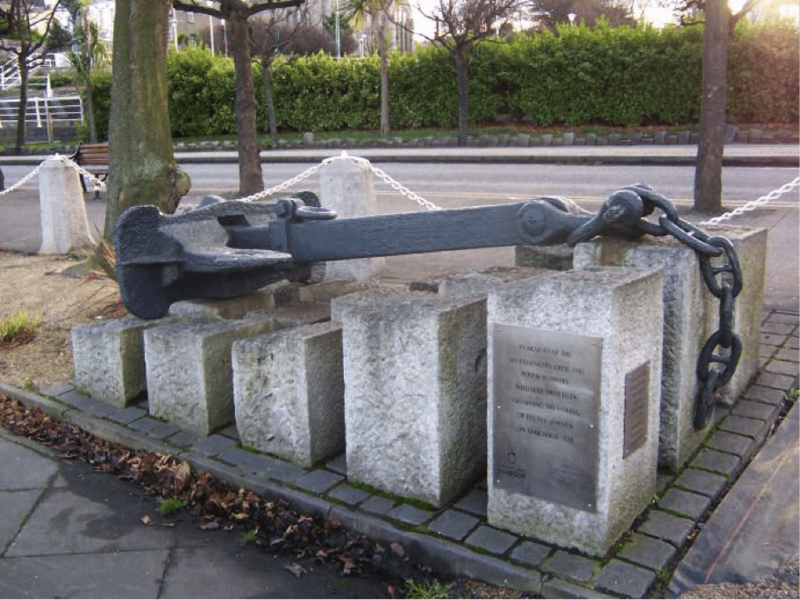 Approximately 150 of those who died on RMS Leinster are buried in Grangegorman Military Cemetery. 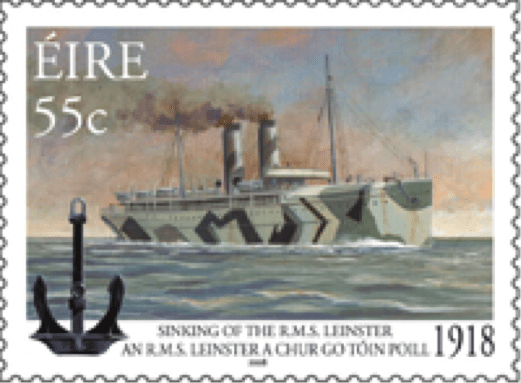 On 30 May 2008, An Post (The Irish Post Office) issued a stamp to commemorate the 90th Anniversary of the sinking of RMS Leinster. All but one of the 22 Postal Sorters on board perished. Plans are at an advance stage to mark the centenary of the sinking during 2018. The Office of Public Works is hosting lectures in the Visitor’s Centre Phoenix Part at 1500hrs on 07, and 14 October. On 10 October, the Office of Public Works will host a wreath laying ceremony and a special tour of Grangegorman Military Cememtery, focusing on the burials from the RMS Leinster disaster. In conjunction with the National Maritime Museum in Dún Laoghaire, a State Ceremony commemorating the 100th anniversary of the sinking of the RMS Leinster will take place in Dún Laoghaire on 10 October.